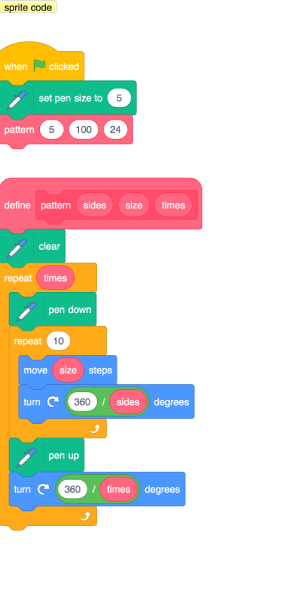 BlockLike.js is designed following Scratch concepts, methods and patterns. The screen is a centered Stage. Interaction is with Sprites. Code is executed in a "paced" manner. 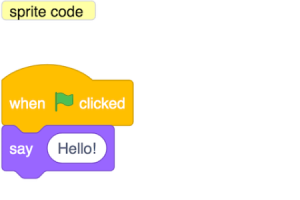 Scratch block code and BlockLike.js text code are meant to be as literally similar as possible. Get Started or learn more at the FAQ and Docs. Additional Scratch and BlockLike.js info is at the FAQ page. A whole bunch of examples are in the examples section. Disabling Auto-Updating Preview makes it easier to code. In CodePen, Click: Settings > Behavior and uncheck box at bottom.